The murdered and mutilated lovers of superheros get the attention they are due in a world created by prolific Peaks Island writer Catherynne M. Valente. 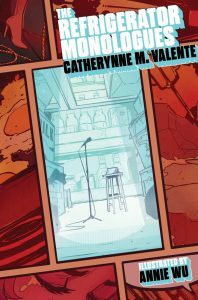 If you haven’t kept up with superhero comics for the past 20 years, you might initially not know what to make of Catherynne M. Valente’s new collection of linked stories. 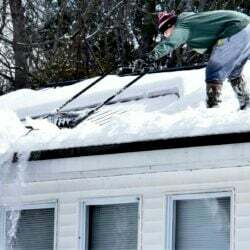 Stick with the book, though, perhaps after Googling “girls in refrigerators.” You should be able to catch on pretty quickly, and the extra effort will have a definite payoff. “The Refrigerator Monologues.” By Catherynne M. Valente. Saga. June 6, 2017. 160 pages. Hardcover. $19.99. They all have good reasons for that anger. Each member of the Hell Hath Club has experienced firsthand the downside of being the girlfriend or wife of a superhero. Or perhaps they dared to don the cape and cowl themselves, before paying the ultimate price. They have been raped, tortured, mutilated, brainwashed, driven insane or disabled. The book begins with Paige’s own story, of how she was responsible for her boyfriend becoming Kid Mercury, how she supported him in his campaign against crime and how she died in his arms after he accidentally snapped her neck while battling Doctor Nocturne. “The Night Gwen Stacey Died” had a big impact back in 1973, when comics were mostly still for kids and hardly anyone – not even the villains – ever died in them. Fast-forward to 1999, in the wake of Alan Moore’s “Watchmen” and Frank Miller’s “The Dark Knight Returns,” two seminal creations that brought a new dark sense of reality to comics. Some American comics creators, predominately men, felt the need to keep things grim ‘n’ gritty by imagining various kinds of violent deaths for their female supporting characters. Too many creators relied on the chauvinistic trope of having a woman die only so that a male hero could be sufficiently motivated to go out and avenge her murder or assault. Perhaps the most notorious instance of this cliché was the one in which Kyle Rayner, a new member of the Green Lantern Corps, arrived home to find his girlfriend, Alexandra DeWitt, dead and stuffed into the refrigerator by the villainous Major Force. 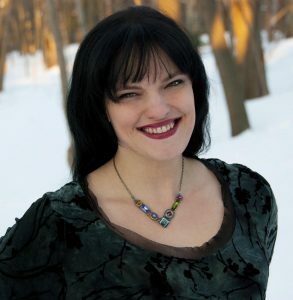 That storyline inspired comics writer Gail Simone to start “Women in Refrigerators,” a website dedicated to tracking the abuse of female characters in comics. Peaks Island resident Valente turned the world of fairy tales inside out with her children’s series that began with the crowdfunded “The Girl Who Circumnavigated Fairyland in a Ship of Her Own Making.” What are superhero comics but fairy tales for modern times, full of outsized characters, arcane rules and stories that get told over and over again with a few variations? The linked stories in her latest book allow Valente to vent her own anger at the entertainment industry’s misogynistic behavior and sexist rhetoric. Because she doesn’t have the creative rights to characters owned by Marvel and DC, she built a superhero universe of her own, one peopled by heroes and villains a shade different from their more familiar, original versions. So it’s Julia Ash instead of the X-Men’s Jean Grey who exists in multiple timelines and wields incredible destructive power. Pauline Ketch is the one in love with the insane Mr. Punch, instead of Harley Quinn pining over the Joker. Even poor Alexandra DeWitt gets to tell her own story, in the guise of doomed artist Samantha Dane. The business of comics is still largely run by men, but the medium seems more welcoming to female creators these days. Writers and artists such as Kelly Sue DeConnick, G. Willow Wilson and Hope Larson are lending their talents to mainstream comics projects that actively celebrate the experiences of women and young girls, superpowered or not. While “The Refrigerator Monologues” depends a great deal on an insider’s knowledge of comic book lore for maximum enjoyment, those readers adventurous enough to parachute into unfamiliar literary territory will be rewarded by Valente’s biting wit, outlandish world-building and well-focused sense of outrage.